Huge List Of Real Companies That Pay You To Take Surveys and Product Tests - Make Extra Money Online! I always get asked for a list of REAL (not fake or spammy) Survey companies that will actually pay you for taking Surveys. I put together this list below of the best Survey and Rewards companies. There are many more out there and I will be adding more as well but for now this will keep you busy. Each panel below has a different twist, some give you straight out money, some points for rewards, but in the end either way you will be paid for your time. My only suggestion would be if you are going to sign up for a couple of these is to use a separate email address for Surveys etc, it just makes it easier to keep track, at least for me. And lastly after you sign up for most of these they do send you an email to confirm your email. Make sure you click the link in the email to activate you account or you won't get the surveys! Ipsos i-Say Community. As part of the Ipsos i-Say Community, you get to see new ideas or test new products and services before anyone else. Earn points for taking surveys and use them towards Cash, Gift Cards or Charities. Win cash and prizes in one or more of their many contests too. Global Test Market: Global Test Market is a community of people around the world who take online surveys for leading market research companies. Earn rewards for every online survey you complete. Toluna Opinions: Earn $1- $5 each time you qualify and take surveys. Test products for free and share your opinions! Plus you will get an entry for a $2,500 sweepstakes when you register. MindField Online, where you earn cash incentives for every survey you complete. There are no gimmicks.Members earn real money for each survey completed. Valued Opinions: Get Paid $5 For Each survey. Valued Opinions is a service which rewards you for taking part in market research surveys. 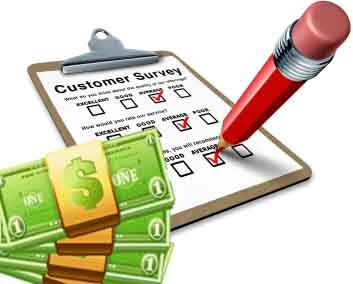 Receive up to $5 for each survey you complete, and up to $50 for completed specialist surveys.